During Spring and Summer 2010 an attempt was made to count and record the breeding success of Stonechats on the Ayrshire coast. This followed a severe winter, and one of the aims of this survey was to record the rate at which the population could recover from such an event. Earlier records had shown that this recovery rate could be quite rapid, providing favourable conditions existed during the breeding season, and the early 1980s had provided some evidence for this. However, most previous attempts to note the recovery rate of the population was patchy at best, and had no real focus on any specific habitat. It had been thought that one of the habitats to be most rapidly re-occupied would be coastal scrub. Most of this habitat occurs along low lying dune systems or coastal clifftops in Ayrshire, with a few areas of estuarine saltmarsh added to the mix. Hawthorn scrub, Gorse and even Rosa bushes are used for nesting in these areas, with most of the birds’ feeding requirements being met in the nearby areas of grasses, saltmarsh and shoreline. With a run of consecutive mild winters, it’s possible for many Stonechats to remain on their coastal territories throughout the year, although some noticeable migration occurs during Spring and Autumn, involving young birds and also, probably birds from outwith Ayrshire. So, in 2013, the Ayrshire coastline, extending landward for up to 1 km, was surveyed by a group of SOC and RSPB volunteers between March and August, with the main aims being to discover the occupation and, if possible, success rates of breeding Stonechats. Coverage was almost 100%, with one or two “less suitable” stretches receiving a bit less attention. After two relatively mild winters, expectations were high, and many Stonechats were soon reported back on traditional territories during February and March. However, our fickle weather played a strong hand once more, with cold, snowy weather setting in during April with many parts of South-west Scotland receiving particularly heavy snowfall. This resulted in breeding failure for many, early nesting species, including our Stonechats. Occupied territories were soon deserted and birds simply disappeared, just as observers began their search. With this unseasonal weather stretching well into May, most of the previously occupied coastal territories were never re-occupied, but some successes were reported from locations where birds had somehow managed to struggle through this difficult period. Occupation and breeding results are shown below, with a comparison provided between the 2013 survey and the results of the brief survey carried out in 2010. Occupied territories are referred to by a site name, rather than a 6-figure grid reference – the latter will be used in future work. In total, 36 sites were examined, with between 18 and 20 sites holding territorial birds between January to March at least (no significant change from 2010). 12 territories were occupied by pairs, and 7 pairs were recorded successfully fledging young. Not surprisingly, the brood sizes recorded were small, but the improved summer weather meant that observers had a chance to catch up with results at most sites. 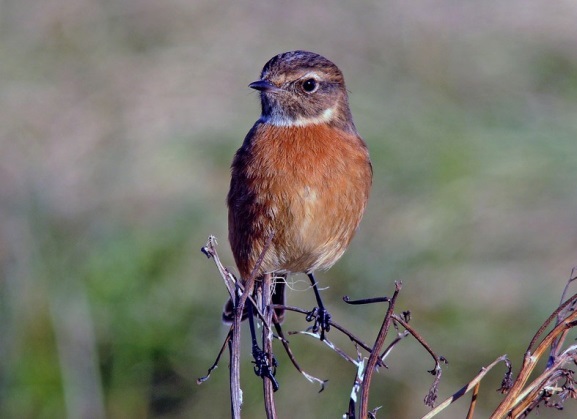 In summary, the results of the survey suggested that no improvement in Stonechat breeding numbers occurred (since 2010) in coastal habitats during 2013 and that the population remained at a depressed level following the effects of the 2010 winter. However, although the Spring weather played a crucial role in the 2013 results, a welcome re-appearance of Stonechats to many of their former haunts happened during the Autumn and, with the possibility of a mild winter during 2013-14, there may be an improvement this year. My thanks are due to the many observers who took part in this survey. It would not have been possible to cover such a large area of coastline without your help. I would welcome any records for 2014 so that we can keep an eye on the future of our Stonechat population. Those who helped with survey work: F Alison, J & B Anthony, G Brogan, A Brown, T Byars, E Forrester, A & A Gilchrist, R Hissett, N J Lawrie, B Lennox, E Leyden, H Martin, G McAdam, G Macdonald, J & S Montgomerie, D Rackham, G S Riddle, J Rogers, T & G Scott, A Simpson, C Smith, J Thomson, R Turner, R G Vernon and D Watt with apologies to anyone inadvertently omitted.